Buzz Blog: Can Math Explain Ideological Conflict? B Group: The "B's" hold the opposite view. Hipsters need not apply. The Moderates: Moderates neither support nor oppose these glasses. They remain undecided or uninterested. The Zealots: The zealots will steadfastly support black frame glasses to the death. While the hipsters, hipster opponents, and moderates can all be swayed to join another group, the zealots will never switch sides under this simple model. Both the zealots and the A group support the same ideology, but the zealots support it more strongly. Over time, two members of any group are randomly selected to be "speakers" and "listeners." Speakers spread their ideology to listeners, but the effectiveness of this spreading depends upon the two individuals' respective groups. 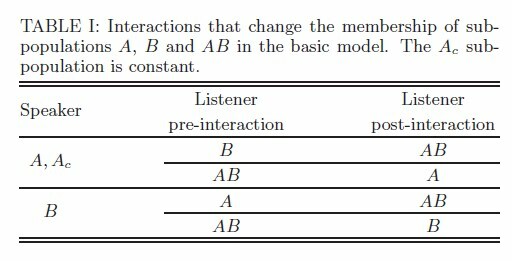 In the most basic version of the model, an A or B (extremist) speaker will always convince a moderate listener to join their cause. As a speaker, an extremist from group A will convince an extremist from group B to become a moderate and vice versa. Moderates can't change anyone's mind, however. The chart below details the various interactions and ideological shifts that change under this most basic model. With a framework in place, the team could map ideological changes with fairly simple rate equations. Although this very simple model may not fully represent how ideologies change, the results are fascinating. The team ran the model until the populations reached an equilibrium. According to their simulations, all of the hipster opponents and moderates will join the black-framed ranks if there's a sufficiently large contingent of zealot hipsters at the beginning. If the zealots represent 13.4 percent of the population and everyone else is a B group member (hipster opponent) initially, all moderates and B group members will eventually change their minds under this model. When the team simulated their model on the backbones of several real life social networks, they found similar results. The critical percentage of zealots required to sway public opinion was uniformly smaller, however. But this situation doesn't encompass all of the ways people change their minds in real life. Surely, for instance, someone who's indifferent to hipster fashion wouldn't immediately don new clothes after someone told them to. People aren't that fickle. 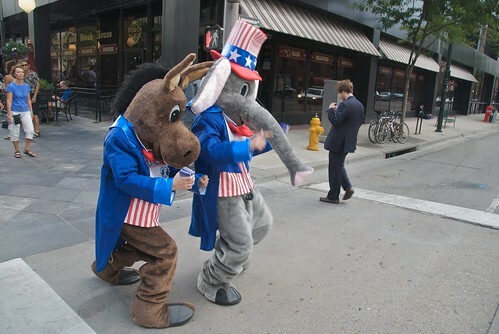 To account for this fact, the team ran their model again with a "stubbornness" factor. Intuitively, you might expect that making the moderates more stubborn – or less likely to change their minds – would lead to more moderates at the end of the simulation. That's what happens, up to a certain point. However, stubbornness eventually causes the extreme A group to take control of public opinion once a threshold has been reached. Overly stubborn moderates will rarely convert to the B group, allowing the zealots who support the A position to dominate the ideological battle. In addition to adding stubbornness, the researchers modeled 6 other scenarios in an attempt to find the most moderate-friendly situation. All but one failed to deliver. The researchers tried several other scenarios, including one where the moderates could influence the extremists, but five of these scenarios failed to provide a sustained equilibrium of moderate ideology. Only when an external parameter swayed the extremists (the authors suggested this could be a "media campaign or environmental influence") did the moderates maintain control. Below is a glimpse into three of the scenarios, including the "stubborn moderates" and externally influenced extremists (labeled as "nonsocial deradicalization"). In both graphs, the end populations as a fraction of the total population are shown for the B group/"hipster opponents" in our case (blue dots), A group/hipster supporters (red plus signs), and moderates (large, magenta circles). Image courtesy of Marvel et al./American Physical Society. 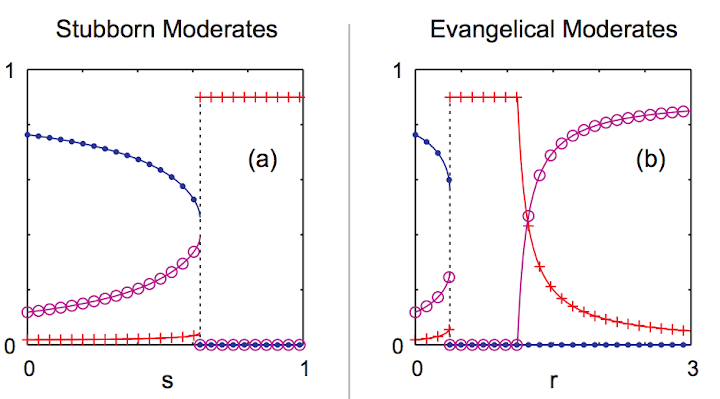 In the above graph on the left, the authors mapped the equilibrium populations for the A, B, and moderate groups for varying levels of moderates' stubbornness. Every scenario started with a small, constant population of zealots that isn't graphed. The y-axis measures the fraction of each sub-population that represents the total population at the end of the simulation. Along the x-axis, the stubbornness factor, s, ranges from 0 to 1 with 0 representing moderates that will always convert and 1 representing moderates who will never change their mind. Although small amounts of stubbornness lead to a small moderate population surviving the ideological battle, overly stubborn moderates will eventually succumb to the hipsters' ideology. 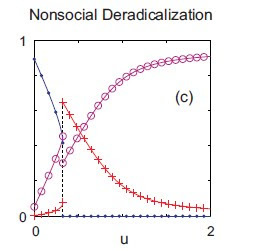 On the right, the same y-axis population fractions are graphed against r – the likelihood that moderates will convince the extremists to join their ranks. For a significant range for this r value, all of the "evangelical moderates" (represented by magenta circles) will eventually join the zealots (who remain constant) and A group hipsters (red plus signs). If the moderates are convincing enough and have a correspondingly high r value, however, the opposite will happen. This scenario, in which extremists were convinced by an external influence and not the moderates, always led to the moderate ideology surviving to some degree. Image courtesy of Marvel et al./American Physical Society. The final case depicted above was the only scenario that always left at least some moderates surviving. Here, "u" represents the likelihood that an extremist would become a moderate due to pressure from an external influence. According to these preliminary results, external influences lead to more moderate public opinion than direct contact among the various groups. At least that's true for this simulation. The authors cautioned in their paper that there's plenty of room to build upon this model, and the simplified model has several assumptions worth investigating further. Nonetheless, the research provides an interesting avenue to start mathematically mapping ideological shifts. I think you did cool solution when you choose this subject of the blog article here. Do you generally make your blog articles alone or you work with a business partner or a helper?